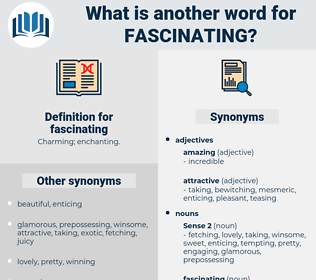 What is another word for fascinating? stunning, amusing, charismatic, fantastic, impressive, stimulating, engaging, brilliant, inspiring, rewarding, marvelous, entertaining, splendid, fabulous, vibrant, beautiful, spectacular, worthwhile. interesting, compelling, exhilarating, glamorous, gripping, attractive, striking, passionate, appealing, magnificent, colorful. distasteful, awful, abhorrent, abominable, hideous, invidious, horrid, odious, flat, sterile, obnoxious, revolting, disheartening, appalling, horrendous, demoralizing, sickening, nauseating, noisome, shocking, discouraging, dispiriting, offensive, unexciting, loathsome, pedantic, Operose, Jading, horrible, unattractive, repugnant, repelling.
" Mr. Voltaire is a very fascinating man," I suggested.